[AUTO](VC/RC):When placed from hand, COST [bind a card from your hand], and draw a card. 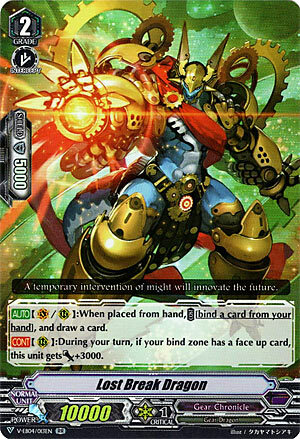 [CONT](RC):During your turn, if your bind zone has a face up card, this unit gets [Power]+3000. Totally uninteresting to talk about, primarily because he filters and he helps set up the main gambit – for a turn. The hand refresh is enough of a reason to play this thing really, plus he hits Force Vanguards unboosted in a pinch. Boring but useful. Play at 4 because we have not much else.